In January, my godson Andrew moved to Raleigh to help us in our missionary efforts here in North Carolina. We met about eight years ago online, when he was still in high school and had just developed an interest in the Orthodox Christian faith. Eventually, he embraced the faith, and when he was baptized in January 2008, I served as his godfather. The work that began here with lay-led services in November 2006 has certainly blossomed, but there is much to do; a lifetime of work, in fact. 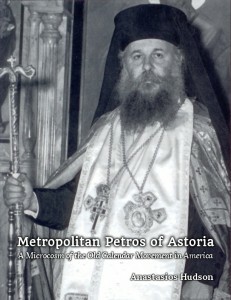 Orthodox Christianity is not well-known in the United States, and our traditionalist stance towards the questions of Ecumenism and the Church calendar places us even more in the minority. As such, Andrew did not have a parish to attend where he lived out West, and so coming to North Carolina to work with me was the best option for him to have a regular Church life. He also shares with me a great desire to see Orthodoxy spread here. We thank God for sending him to us, because he is a hard worker and is quickly learning the many facets of serving in a small mission community. This has raised the question in my mind of streamlining and replicating the experience, because I’ve never been a “one trick pony” so to speak. My goal is to establish Churches which plant other Churches, and to do so aggressively. Rather than just starting one parish, I hope that a network of parishes will be established in this region over the coming years, and in fact, we are currently witnessing people across the state come forward and pray for and plan for missions in their own cities and towns. How then can we best replicate this on a larger scale? It is important to learn from the work others are doing. Recently, I found the Raleigh Fellows program, and it intrigued me. I hope that this Anglican program can be adopted into an Orthodox context. I am currently in discussions with one of the Fellows to learn from the program. The idea is still new in my head, but basically young men (eventually women as well) would come to the area to learn from me and the other leaders of our missions in North Carolina how we have accomplished what we have accomplished, and more importantly, develop their spiritual lives and hone their vision of the Church’s evangelistic work so they can apply it autonomously in their own contexts. Perhaps in five-seven years we will have five or six young men living in the area and learning how to plant Orthodox missions, to be sent out upon the completion of their work to spread the Gospel and then found similar programs and initiatives in their area. Some would stay in North Carolina to help us, while others would serve in disparate places where there is a need for Orthodoxy to be established. If you are interested in becoming an intern/fellow in such a program, please let me know, so that you can provide input as we lay out the vision for such a program. Others are invited to pray for us, or to support us financially in our efforts. Contact me for more details, and God bless you all.